Auckland is at a turning point. At current growth rates it will pass two million people sometime during the decade beginning 2022, at which point social and infrastructure problems will begin to compound. 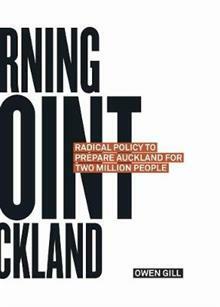 This book is for two groups of people: new residents coming to Auckland who will need us to prepare the way for them, and current residents who wonder what we can do to improve the city. Drawing on the latest international thinking on cities, Owen Gill puts forward a radical yet sensible agenda for change to allow Auckland to take its place as a leading hub of the Asia-Pacific region. Turning Point Auckland features colour images illustrating Auckland's diverse environments and succinct appendices that summarise the author's proposals for making this a truly great city.